“Sailing in the UK? In November?” most people who asked our plans for the recent Eid holiday thought we were mad and there were moments before we left Dubai when we wondered if it was the right thing to do. We had originally planned to drive to Salalah in Oman during Kevin’s week off but Temptress’ new sails were ready and needed a final fitting before we settled the sailmakers invoice. As it turns out the forecast was for easterlies going round to the south. It rained on and off during friday but the banks of grey clouds meant that the above average temperatures didn’t fall far at night. 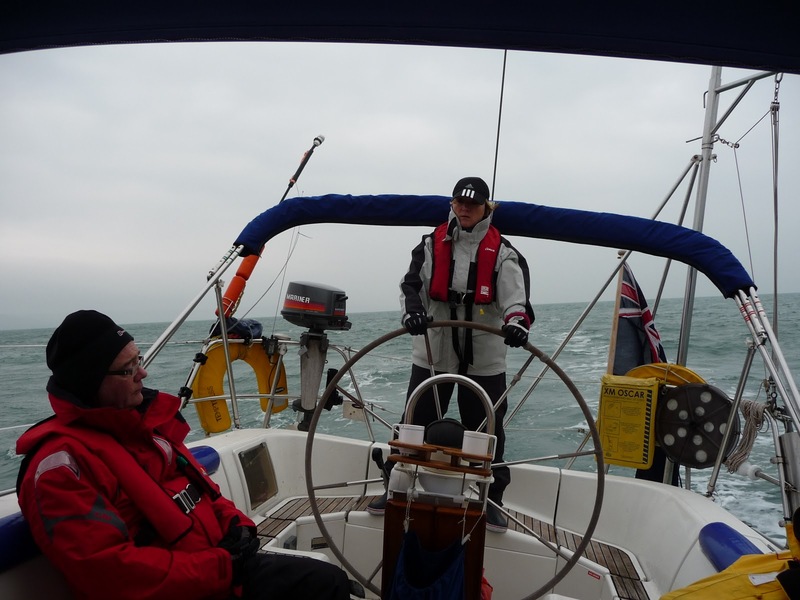 After a day manhandling acres of sail cloth our crew arrived and on Saturday morning Glyn & Sheila had their first taste of the Solent. 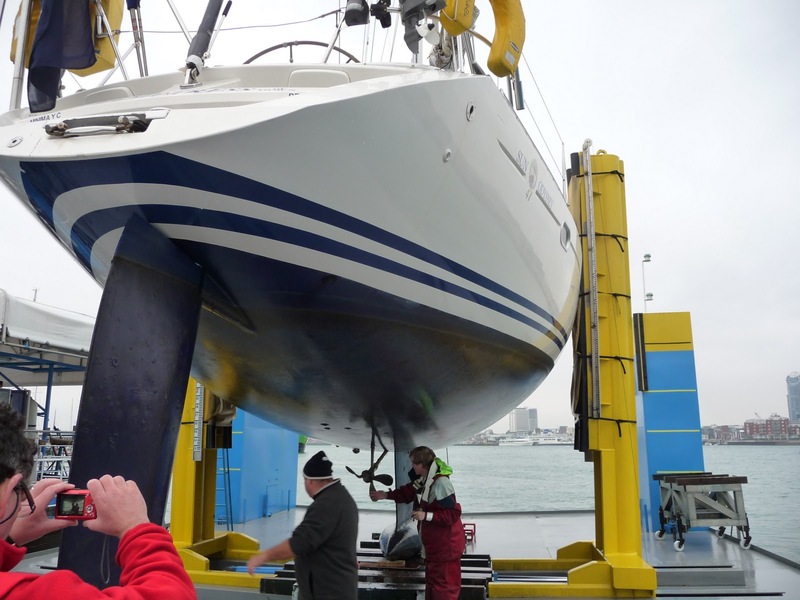 We headed for the boatlift in Gosport for a quick scrub to remove several months of growth, actually much less than we had expected, just a generous coating of green slime). Then on to Cowes and a convenient supermarket for the week’s provisions. From there it was down the Needles Channel with the tide for Poole and Weymouth. In Poole Temptress demonstrated that if it can go wrong it will go wrong even in the most benign conditions. We tried to achor off Brownsea but our hefty CQR wouldn’t hold in the hard sand so we picked up a nearby mooring whilst we ate lunch. Close by was a small pink buoy, marking a fish pot maybe? The tide turned and the wind dropped off a bit, suddenly the buoy became a mortal enemy, yards of rope catching on our rudder. Kevin and Glyn pulled up several lengths of rope tied together at intervals and attached to not one but three fishermans anchors! It took a while to disentangle the rudder. The Brownsea Island ferryman promised to pick up what proved to be someone’s mooring tackle which had been washed down from further up the harbour, if we chucked over when we left. It may still be there for all we know! From there we offered our crew a choice of destination. 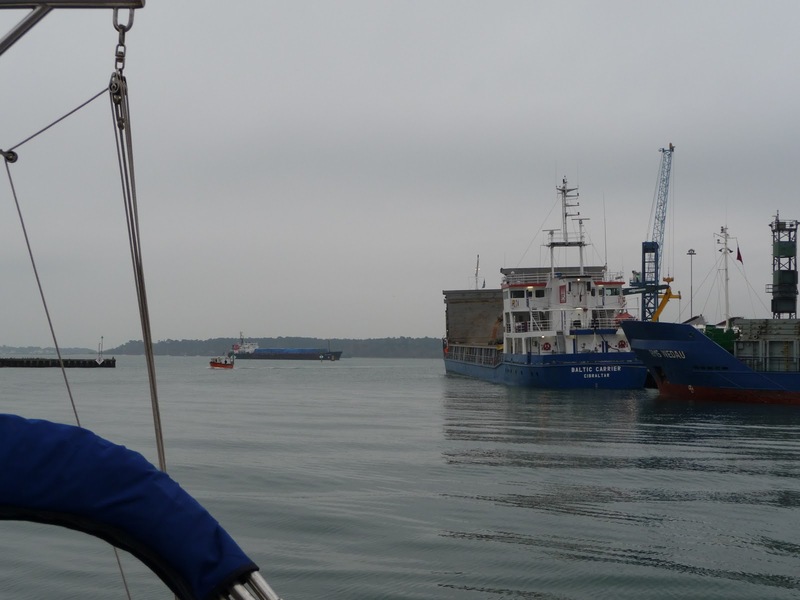 The tide would be favourable mid afternoon so a night sail to Newton Creek with its tricky entrance or the Hamble and a chance to experience busy shipping lanes at the entrance to Southampton Waters? They selected the latter and eagerly planned the navigation. All went well, we saw lots of ships and ferries including a liner leaving on the evening tide from Southampton, they marvelled at the numbers of boats moored in the river as Glyn at the helm picked his way through the reds and greens. Then at the top of the Hamble there was a moment of minor panic. The Skipper took the helm, his local knowledge preventing Temptress from becoming a large garden ornament on someone’s front lawn as he made the sharp left hand turn. In the mornng we realised that a vital mark indicating the dogleg just prior to Swanwick was unlit. 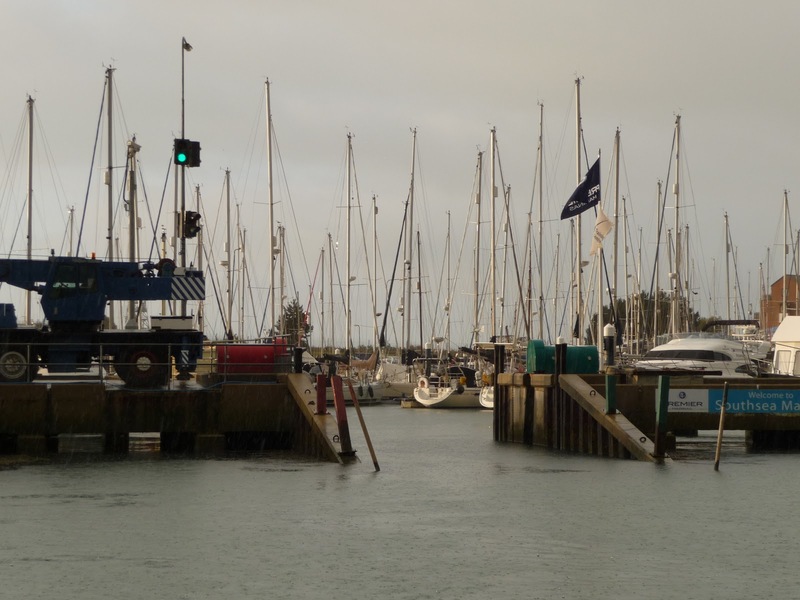 On our last day we anchored off Stokes Bay for lunch, tried and failed to get up Southsea’s narrow channel an hour after low water, picked up a harbour mooring and waited. 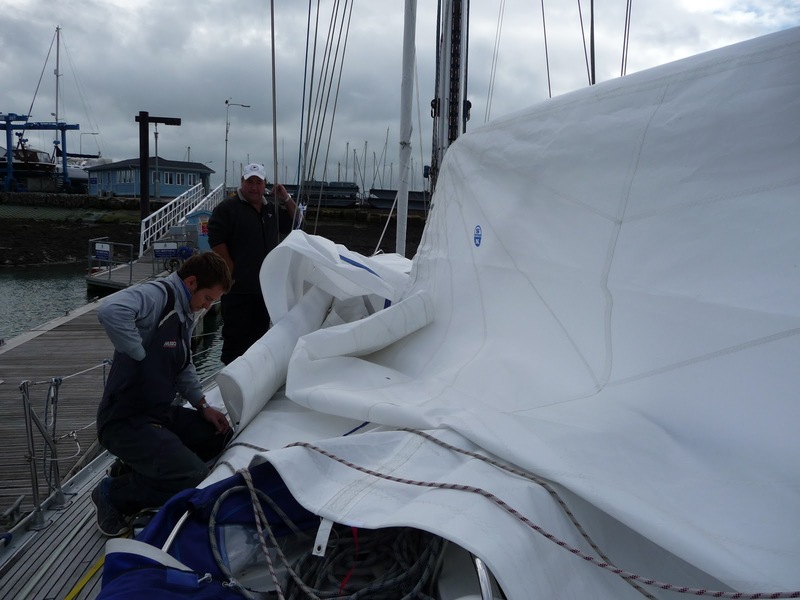 The next morning was a flurry of removing sails, cleaning Temptress inside and out and emptying water tanks. We felt extremely privileged to have had a relatively warm week’s sailing in great conditions so late in the year.